Batang Gilas’ loss against Australia was a lot like a relationship that you already knew was going to go wrong the moment the couple got together. Initially, it went well for Batang Gilas. They started off the game leading 11-8 with 2 minutes remaining in the first quarter. They were playing a lot better compared to their previous game against Malaysia, moving the ball with purpose and involving the bigs well with their offensive sets. It was a formula that was working well, and it was only a matter of staying composed and adjusting to whatever Australia was going to throw. Australia countered. Quickly. So quickly that the 11-8 lead of Batang Gilas immediately evaporated and turned into an 18-13 deficit by the end of the first quarter. Just like that, Batang Gilas could not find any response to Australia’s attack. Coming into this match-up, Tamuri Wigness was the very first name team had in mind when talking about Australia. He was hyped up as a Kyrie Irving 2.0, someone who had impeccable skill in handling the basketball and creating for his team. As good as Wigness was against the Pinoys (Eight points, seven rebounds, four assists, six steals), he wasn’t the primary reason Australia won. He was brilliant all game long, no doubt about it, but it was the wings of Australia that brought them home versus Batang Gilas. Six players scored at least eight points for Australia led by Jay Rantall with 15 points. It’s been stated before — The backcourt and wing depth of this Batang Gilas squad is suspect compared to previous years. As good as the range of the team is, their ability to create and handle the ball isn’t in the same pantheon as what the 2013 and 2015 U16 teams had. Against Australia, it was exposed to the brim as the team committed a whopping 26 turnovers. The Boomers took advantage of the added opportunities, scoring 26 points off the turnovers they forced against the Pinoys. It’s easy to pin the blame then on the big men of Gilas since they weren’t able to respond to the length of Australia. However, it isn’t that easy to jump to such a conclusion. First and foremost, the big men were actually the lone bright spot in this loss versus Australia. Kai Sotto was respectable, while Raven Cortez and Yukien Andrada showcased flashes of solid play. Second, it’s important to take note that Batang Gilas’ average height of 6’4” for the tournament isn’t entirely reliable. The average may be equal to the number Australia has, but it’s actually jacked up by the tremendous heights of Kai Sotto, Geo Chiu and Raven Cortez. Aside from those three, there isn’t anyone else in Batang Gilas close to that kind of length. This is in contrast to Australia, where the length of the team is consistent. From their wings to their front court, there is length, with a whopping eight players among the Boomers standing at 6’4” and above. If you think about it well, the +18 rebound advantage that Australia had was to be expected. Three 6’7” and up players up against eight 6’4” and up players? That’s a recipe for disaster if that’s the way we want to view this loss by Batang Gilas. On that note, that’s not to say this loss was entirely hopeless for the team. As big as the deficit was, there are things the team can work with as they undergo do or die games in the coming rounds. First, the team played with a lot more purpose compared to how they played versus Malaysia. In their previous game, the team looked lazy when it came to the way they played. On the other hand, against Australia, the team ran their sets with a goal in mind, and much more focus compared to what they had previously. Mac Guadana led the team with 11 points, while RC Calimag had 10 points. First thing to take note off: Check out how much attention Australia is giving the guards of Batang Gilas. It was a weirdly constructed five out-ish set by Batang Gilas, but you can see the eyes of the Australian defenders were on Terrence Fortea and Forth Padigao more than anything else. Second: Watch how easy it was for Sotto to roll to the rim because of how much attention the guards were getting. This is the ideal recipe for success. The team plays off each other and creates more opportunities because of the attention the other is getting. That’s not to say the big men don’t have to adjust. They definitely do, as in any team setting. But for the sake of discussion, it’s clear the guards and wings have their work cut out for them. Their decision making in the perimeter has to improve, and there has to be more weak side movement whenever they dump the ball to Sotto in the low post. The break-up was nasty, a 30 point loss. But this should have been expected. The least Batang Gilas can do from this disaster is to learn from this, and to become better. 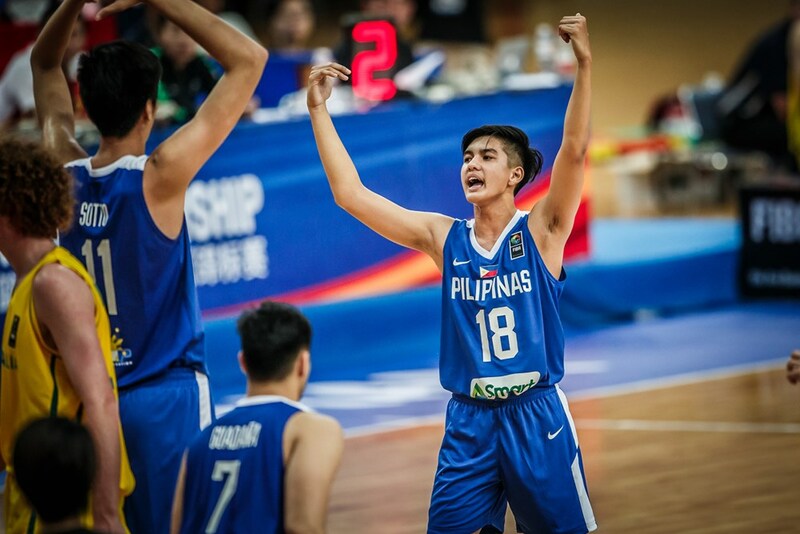 Batang Gilas will now have to go through a Playoff game tomorrow to be able to advance to the Quarterfinals of the FIBA Asia U16 Championship.